Have you ever ask yourself, what do you really want? The problem we have with Life is that we think Life is unfair. We want a car; Life gives us a motorbike. We want to be rich but we feel Life gives us more debts. So yeah, Life seems unfair. Our problem is we don’t ask questions. We don’t ask questions to ourselves, a place where Life Is. A body where Life is unfolding. We don’t ask Life what we want! (or God if you like to refer Life as God). Often when I asked people “What do you want?” – They answered, “I don’t know”. Imagine Life is giving you I-Don’t-Know. And Life is unfair. I-Don’t-Know is a pretty lazy personality we embedded in our cells. Instead of taking some moment of silence to feel the question, people jump right into I-Don’t-Know because their mind cannot give them an answer. That’s how lazy we become. Learn to ask yourself questions and give some space to receive the answers. In every question you ask, there are answers. You just have to be patience. And second, ask in a particular manner. Be specific! Don’t ask I-Want-To-Be-Rich. It’s a general request. But Life gives it to you anyway. If today you earn an extra $10 compared to yesterday, then you are richer than yesterday. Life is fair. It gives us what we asked. Our problem is, we don’t ask questions and we have no patience for the answers. We hardly ask questions about ourselves. We are afraid to ask questions about societies and beliefs. We don’t want to provoke our thinking mind. We fear the answers. We are not ready to receive. And Life is so unfair . Now let’s go down to June 2013. The article gives you tips on how you can unleash your true potential. It’s a small act you can give to yourself on daily basis and get your subconscious mind bring the wonders accordingly. This is an update for our upcoming programs for December 2012. Please make sure you follow us via our Facebook Page, Twitter or Blog to get instant updates on the programs. 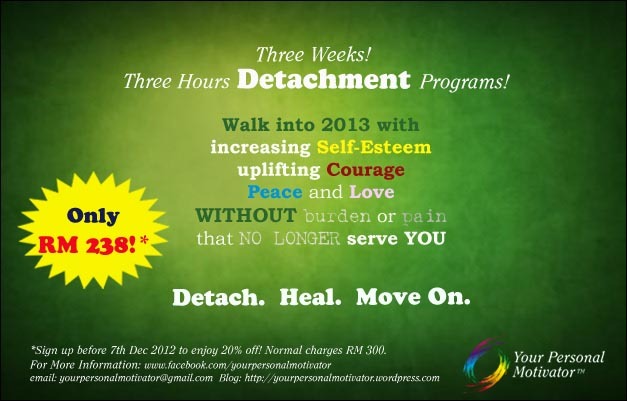 Detachment Program – Starting 1st December 2012. 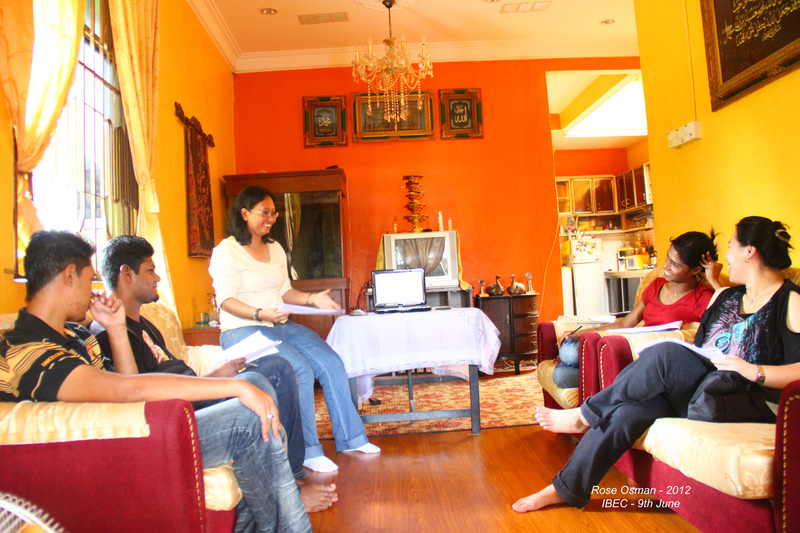 Starting 1st Dec 2012, we are conducting Detachment Programs for individual who wants to move on but they have no clue the right ways to move on. If you are stuck with your hurtful past, excessive emotions pain that no longer serve you or negative habit, you can consider this program and detach yourself from the non-beneficial energy. To find out more about this program, please refer Detachment Program. *Don’t forget to sign up before 7th December to enjoy 20% Discount on this 3-in-1 program. 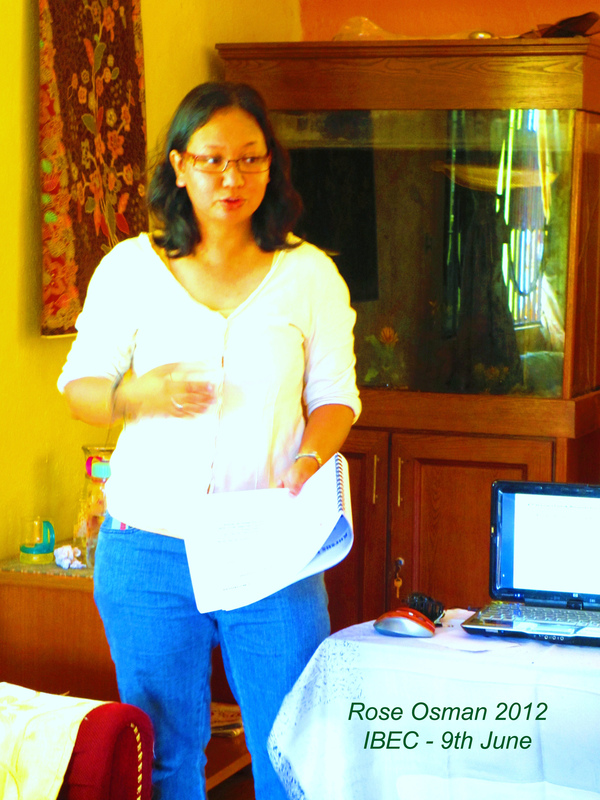 Introduction to Reiki Healing Free Talk – 16th December 2012. 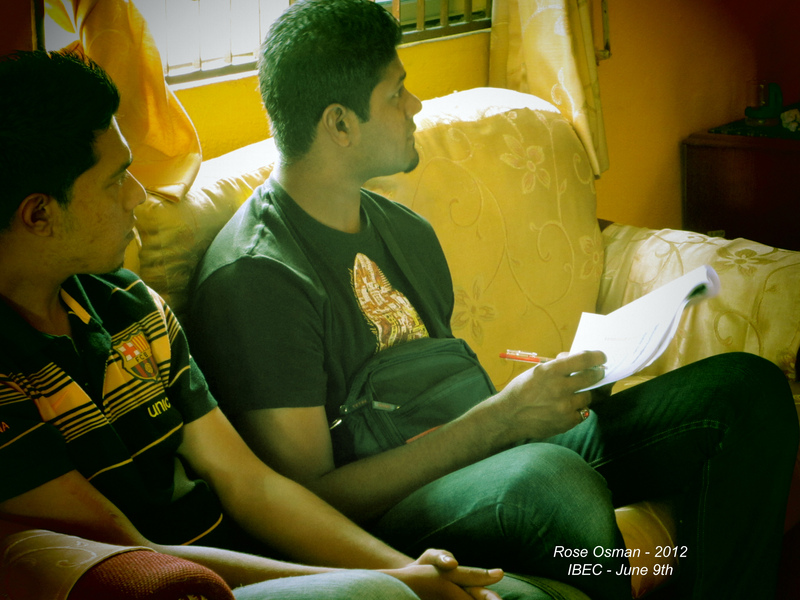 This program will be held on 16th December 2012 at Jalan Meru, Klang. The session starts at 4pm until 6pm. 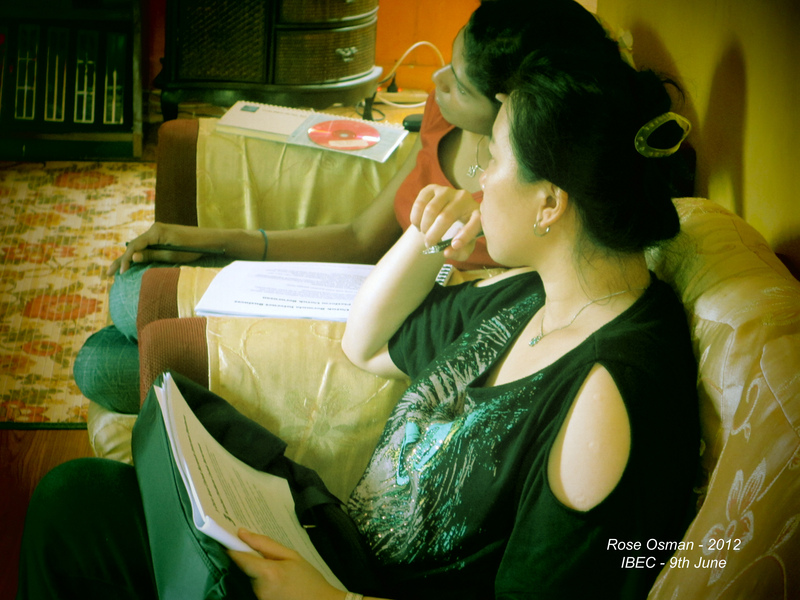 In the session, our Energy Coach, Rose Osman will introduce participants to Reiki Healing and the benefits of Reiki Healing in many ways. There will be healing demonstration for selected participant and Q&A sessions. Stay tuned for more updates on this. Whenever I hear this statement, my heart will scream “Rephrase! Rephrase!”. It is the worst and the most terrible wish in the world. Most people say it when they breaking up with their lover and the statement is just an expression of broken heart. But ponder this for moment; what if the wish comes true? 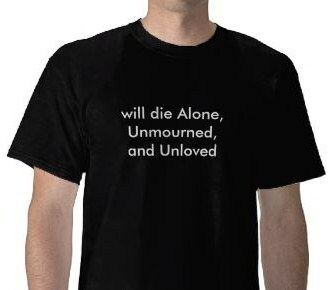 Look deeper into the meaning of Die Alone. Aren’t it’s ugly, torturing and suffering to the soul? Never wish this to yourself! Ah! Another statement of broken heart and right away punish the rest of the love in the world. When a person says this, whoever has love towards him will turn around and walk away. Of course this is a metaphor. The realities are worst. People who love you will stop contacting you, parents started to scold you, friends started to unfriend you and more to list it down. So why wish NO ONE loves you? Look around, loves are always everywhere. Keep on affirm it and you will always end up with a wrong lover in your life. Here some tips for you; avoid this word ‘always’. It’s literally means forever and never stops. So you had a wrong lover before but it didn’t mean you will have another wrong lover in the future. What have went wrong, let it behind but take the lessons wisely. Never ever punish your future lover just because you had the wrong ones before. Aha! There you go! Many people say this to express their frustrations over their financial situations. Its sounds like a pity statement from themselves to the Universe and God. Guess what, when you say it and by all means, you just close the doors to the wealth instantly. When you say it to your insurance’s agent, you probably have to pay a high premium for the insurance. When you say it to your doctor, you have to spend more time and money to see your doctor again. When you say it to the world, all the viruses, the germs, the illnesses are looking at you, waiting to enter your body. So where is the goodness to you here? Stop saying you can get sick because to get sick is normal. What’s not normal is to get sick easily. Instead, say this; “I can get healthy easily” and it will change health over the time. When you accidentally say it, there’s always a chance for you to rephrase it. These are the normal and ordinary statements people say to express their feelings about their situations. We are so used to it and didn’t even realize that these statements have power in bringing the reality into our lives. And the worst part is when it gets real because we actually do not even want it to be real at all. Be aware of your words as it turns into wishes; be conscious of your wishes as it turns into your reality. Give-up is so much easy to be done compare to the hard work and failures we get in achieving the life we want. It also seems so much easy to leave the burden of failures than carry it throughout the journey to the desire destination. Give-up so we can live in the ‘comfort zone’ like before. Give-up and we will have peace of mind. If you think exactly like these, beware that Mr. Give-up has just manipulated you! I almost gave up too. Almost everyone will have their give-up moments. The moments exist for reason; to test our interest, will, desire and belief in the things we want. When moments like this come to us, those who have interest, strong will and desire to achieve the goal and belief everything is possible will be rewarded as promised by God. Those who listen to Mr. Give-up and believe him more than themselves, will lose the wealth and success that earlier was booked to be theirs. It is sad to see people who choose to give-up easily. We must understand that failures and hard-work is part of success package. No one in the world achieve success, wealth and greatness without going through failures and hard-work. Here’s the important message about giving up. What people didn’t know is, when they give up, they indirectly send the message of “I am weak” to their minds. Not just that, giving up in many religious means cutting the string between us and God’s Grace. If you feel give up in finding the wealth and success, look at the picture below. It says three things to me. First is, wealth and success is already there. It just needs us to dig it until we find it. Second is, when we give up, the wealth and success will be meant for someone else. 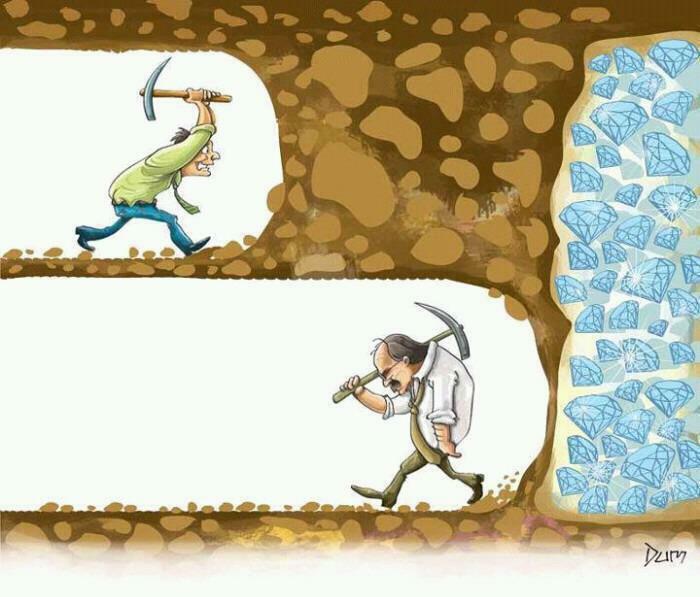 And third; if we give up, we never know how close we are to the wealth and success. Store the picture in your mind because the picture says it all. We never knew how close we are to the success. Thank you for cartoonist who drew this photo. Do You Take Illness Seriously? When I’ve been given opportunity to perform Reiki Healing to my customers and others, I’ve seen clearly how they expressed their true goal in these two categories. At glance, both of it looks the same (that explain why many people think it just the same) but the result is not the same at all. Often time, people choose to fix their illness instead of improving the health. Allow me to describe the different to you. Fix the illness comes with many meanings. Fix it so the illness gets more appearance. Fix it so the illnesses can growth better. Fix it so the illness is good to be alive. We fix things for one reason; to use it or to wear it. So when we fix illness, we actually want to ‘use’ it and ‘wear’ it. When we say; fixing the illness, we are focusing on the illness itself. We give energy to the illness to expand. We think we spend times in searching the cure for the illness (nothing is wrong with that) but we actually focus more on the illness. In Law of Attraction, what we focus on, expand…and illness is not an exceptional case. Many people didn’t realize that 100% healthy is subjective. I may not be able to jog like others but it doesn’t mean I am not 100% healthy. Health is different from one to another and it change throughout the ages and through external factors like accidents and more. The state of being healthy is subjective. Although being healthy is subjective, improving the health applies to everyone, daily. If you are sick, then you MUST improve your health. If you are healthy, you MUST improve your health too and to sustain your health level. Unlike fixing the illness, when we are improving the health, we give focus on how to improve the health itself. Instead of focusing and give energy to the illness, we are focusing the methods, tools and tips in improving the health like the lists. Listen to the body in silence. Wake up early in the morning. Imaging that fixing the illness is an action that leads you to the left and improving your health is an action that leads you to the right, how can it both result in the same direction? Health and all others in our lives are subject to Laws of Life like Law of Attraction and each term we speak has its own energy and vibration. Illness and Health are very much in different energies and vibrations. So when you choose to state your health being, make sure you state it with the vibration of love. Since everything is in creation right NOW as we speak, the first thing you should do is to choose the right words to state your health being. The reason is every word has its own energy and vibration. It attracts same elements that have same vibrations and it brings you to the place you wish to be (being healthy or being ill). “I am improving my health and healthiness is flowing in my body now and in harmony”. 1. This article do not stated that you should skip your medicines as prescribed by your Medical Doctor or suggesting that you should ignore the medical aspect in your life. 2. 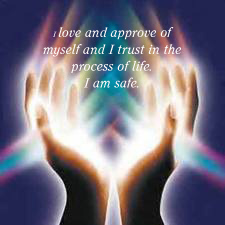 This article is to improve your health through positive and love affirmations. 3. For more information and consultation in healing, please contact me through my email. Thank you.